A series about the rules and regulations of street tree planting, pruning, and removal in New York City. Since 1996, Parks has pruned established street trees on a neighborhood–by–neighborhood basis. This process allows us to prune a portion of the street trees in every community board every year. However, if a street tree is damaged, has a hanging limb, is hitting a utility line, or blocking a traffic sign or signal, call 311 or enter a Service Request using forestry service request system. Parks will review the request and take appropriate action if warranted. We do not take routine pruning requests. Certified Citizens Pruners are trained to do light tree pruning which would pertain to any small branches that can be reached from the ground. To find out how you can become a Citizen Pruner, contact Trees New York. Please report unauthorized tree pruning through 311 or our forestry service request system. It is illegal and punishable by law for citizens to damage, destroy, perform unauthorized tree work or otherwise harm a street tree or park tree. 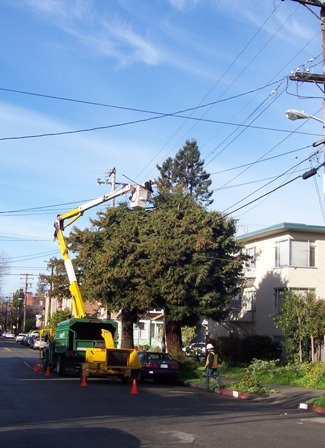 No work may be performed on or within 50 feet of a street tree without a Tree Work Permit from Parks. Unpermitted work can lead to serious tree damage. Anyone caught removing or otherwise harming a tree should be reported immediately. Violations are misdemeanors punishable by a fine not to exceed $15,000 and/or imprisonment for up to one year. To report illegal tree damage, call 311 or use our forestry service request system. Use our new forestry service request system to notify Parks of illegal tree damage, and we’ll route your submission to the appropriate Parks Department division and provide you with a tracking number and details about how your request will be addressed. For more information, visit the Forestry Services and Permits website. It's definitely not a good idea for someone (other than a nyc tree service company to try to prune or remove trees and branches. There could be major liabilities and hazards associated with this. Make sure to hire a legitimate, insured company to handle your needs.